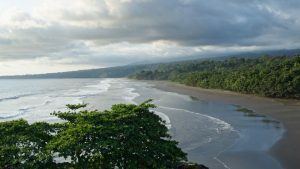 * November 2017 – March 2018: Bioko / Equatorial Guinea: Also in this project our last shooting has been inside the inner crater of the biggest volcano of this island (‘Gran Caldera de Luba’). 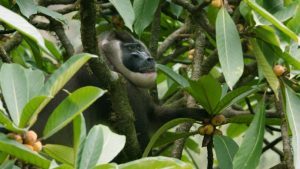 A peculiar bird (Picathartes) was to be discovered and also Black Colobus – another charismatic monkey species. 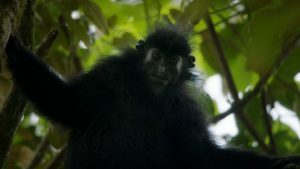 The rare bird we saw shortly but unfortunately couldn’t film but the monkeys we got at the steep caldera cliffs. 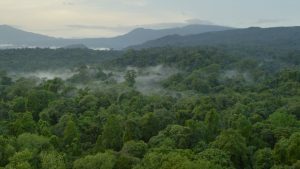 The real stars of that expedition have been frogs and sunbirds as well as the impressive caldera itself. And also our main character the drill we could film high up in the canapé. 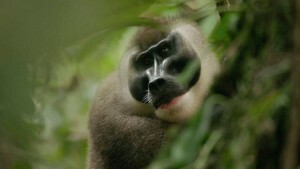 A truly fascinating project with many never seen animals. * April 2017 – May 2017: Kenya: Our last shoot inside the volcano. After we shot good additions concerning the baboon parliament and the lava tubes, we dared to do the descent into the inner crater of the volcano Mt. 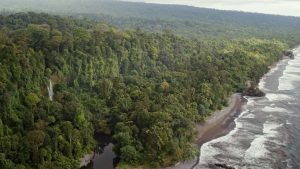 Suswa to camp on hot steam vents… . Pure sauna! Great expedition with Giuseppe Bucciarelli, Alain Lusignan and our Masai friends. 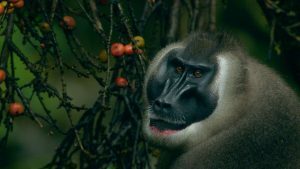 * November 2016 – March 2017: Our colleague Justin Jay and his crew started our 2nd shoot about drills (Mandrillus leucophaeus poensis) on Bioko Island already in November. We joined them in January. 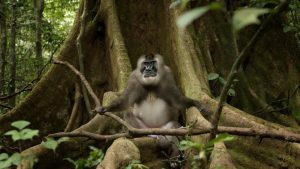 Extraordinary location with an extremely charasmatic monkey species. Fantastic crew! 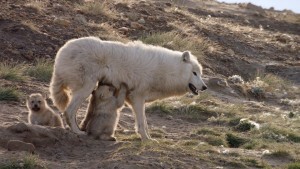 * May – August 2016: Back on Ellesmere – this time it was crazy: We filmed how a rival wolf pack has raided our wolf den and killed all 5 pups on our day 5 in the field: Afterwards weeks without wolves… . Time for side stories… . But we found a new den and continued shooting. Great trip but extremely exhausting. Thanks to Joosep Matjus for joining us as 2nd cameraman. 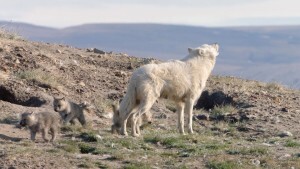 Arctic wolves at the den site [ARRI frame grab]. * March / April 2016: Back on Ellesmere (down to -40°C, windchill down to -49°C): We found our wolf pack from last summer again! 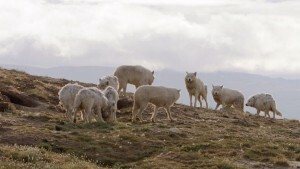 Arctic wolves at a muskox carcass in April 2016 [Photo: Alain Lusignan]. 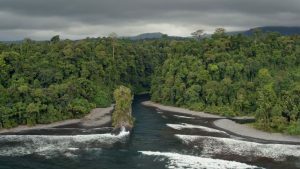 * January 2016 – March 2016: We started to produce our film “Lost Kings of Bioko” about the charismatic Drill on the island of Bioko / Equatorial Guinea – in cooperation with Justin Jay and Drill Films. Fantastic place! 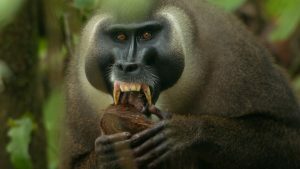 Great monkey! * November 2015 – 4th January 2016: Back in Kenya and the volcano. * May to August 2015: Shooting with the new ARRI Alexa Mini and Canon 50-1000mm on Ellesmere Island in northernmost Canadian arctic. A dream comes true! Arctic wolves are gorgeous! 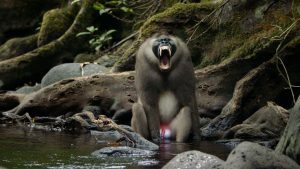 * April 2015: News from Kenya: We are producing a documentary about the volcano Mount Suswa and the unique baboon parliament there – in cooperation with Giuseppe Bucciarelli and Terra Conservation Films. More shoots are planned for November / December 2015 and later in 2016. 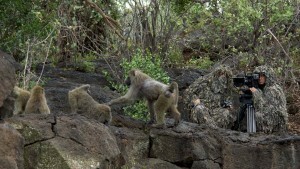 Olive baboons (left) and Gulos (right) [Photo: Alain Lusignan]. * May 2014: We own the very first series-ARRI–Amira! It is so nice to work with such a gorgeous camera. Very well made, indeed. Used in Yellowstone. Grizzlies play fighting in Yellowstone [ARRI frame grab]. 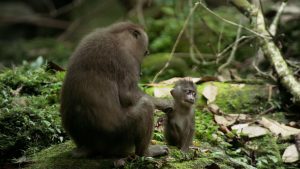 * 2013/2014: We’re working for the new Disneynature theatre movie “Monkey Kingdom“ (please also look here: “SEQUENCE WORK”). Our film JUNGLE BOOK BEAR has been nominated for “BEST ANIMAL BEHAVIOR PROGRAM” at the “other” world’s most prestigeous Wildlife Film Festival, the JACKSON HOLE WILDLIFE FILM FESTIVAL in Jackson Hole, Wyoming / U.S.A., too. 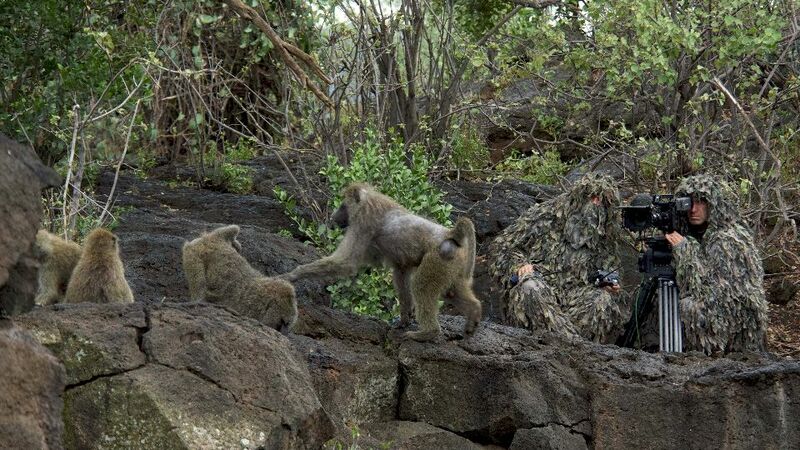 This time the episode “KALAHARI” of the new BBC landmark series “AFRICA” received the award. 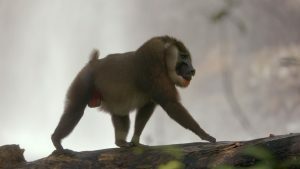 But another production for which GULO contributed sequence work has been awarded at JHWFF 2013: FROZEN PLANET – episode 5: WINTER received the award for “BEST CINEMATOGRAPHY“. The Award Ceremony took place on Thursday, 26th September 2013 at the “Center Of The Arts” in Jackson Hole. 18th October 2012 at the WILDSCREEN Festival in Bristol / England. 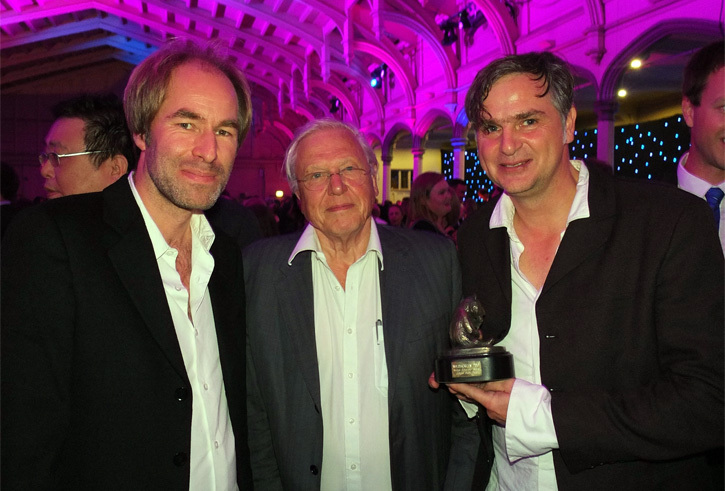 Ivo Nörenberg (left) & Oliver Goetzl (right) with Sir David Attenborough (narrator of JUNGLE BOOK BEAR) [Photo: Klaus Müller]. 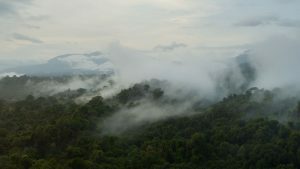 Our film JUNGLE BOOK BEAR has won the “ANIMAL BEHAVIOUR AWARD” at the world’s most prestigeous Wildlife Film Festival WILDSCREEN in Bristol, England. 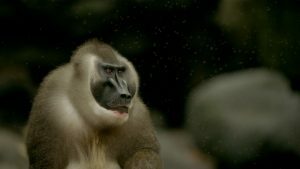 Furthermore another production for which GULO contributed sequence work has been awarded with a PANDA at WILDSCREEN 2012: FROZEN PLANET – episode 5: WINTER has won the “PANASONIC CINEMATOGRAPHY AWARD“. Three more nominations for PANDA AWARDS – which are considered as the “OSCARS” of the wildlife film industry – have completed the huge success for GULO FILM PRODUCTIONS in 2012: JUNGLE BOOK BEAR has been nominated for “FILMS @ 59 SOUND AWARD“, WILD SCANDINAVIA – FINLAND has been nominated for “PANASONIC CINEMATOGRAPHY AWARD” and WILD SCANDINAVIA – represented by the GULO-episode “FINLAND” and the episode “Norway” (nautilusfilm) – has been nominated for “SERIES AWARD“. 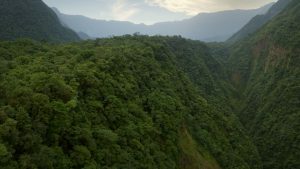 AMERICA’S NATIONAL PARKS – “YELLOWSTONE” + “YOSEMITE”: 2x 50 min episodes for NDR Naturfilm DocLights and National Geographic. The 9-part series is expected to be broadcasted in 2015. 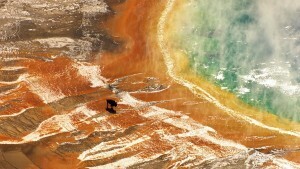 Yellowstone: Bison at “Grand Prismatic Spring” [CINEFLEX frame grab]. 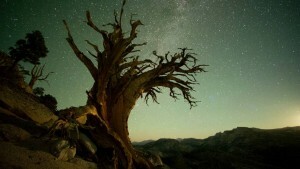 Yosemite: Jeffrey’s Pine at night [Photo: Alain Lusignan].